Mumbai: He has been talked about more for his relationships with the hottest girls in town than his works. But Shahid Kapoor prefers to talk about his 'singledom'. "I think I am single and quite ready to mingle. That's about it," he says. Though stardom has given the actor the much needed spotlight and quite a fan following among girls, he does think that there are certain things he misses in his life, terribly that is. "I miss just taking a walk or playing cricket on the road. I also miss having panipuri at public places. But I don't complain," he adds. Though doing an ad for a fairness cream has invited criticism from many quarters, he has his own stance on it. "The ad is about how men should take care of their persona and groom themselves. And Indian men have this perception that they should never groom themselves since they are men," he says. He has been very protective about his younger brother Ishaan. Does he want him to follow in his footsteps? "I don't want to talk about him as it's not apt for him to see things being written about him or his pictures in newspapers. He should grow up like a normal boy,"
Since the time he has made his debut in Hindi films, there have been countless occasions when it has been said that he looks very young and doesn't fit in many characters. How does he take such comments? "It's all to do with success and failures. Look at Zac Effron abroad he is such a big star and he is merely 22. 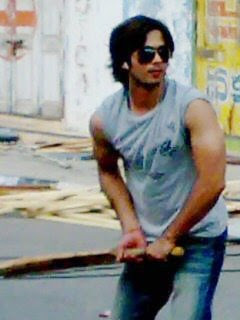 It's all about doing your work diligently and with passion," Shahid says. From his lover boy image, he went through a sea change as an actor with Vishal Bhardwaj's Kaminey. What does he plan to do next? "I want to do a fun film next. Be it Kaminey or Paathshala, I have done serious stuff of late. I want to do a young film now," he replies. What about Mausam, his father Pankaj Kapur's directorial debut? "I am very excited since I will be working with my father at the helm of affairs," he ends.